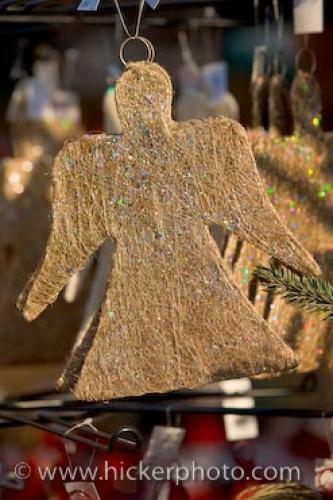 This hanging angel christmas tree ornament was for sale at the christmas markets in the town of Erbach in the state of Hessen in the Odenwald area of Germany. Hanging christmas tree ornaments of all kinds can be found in the christmas markets. This hanging angel Christmas tree ornament is for sale at the Christmas markets in the town of Erbach, in the state of Hessen in Odenwald Germany. There are many different Christmas tree ornaments for sale in the Christmas markets and people can come here and get everything they need to decorate their tree for the season. As you stroll around the Christmas markets it can really put you in the Christmas mood as there are so many different items, from decorations like the hanging angel here, to food and drink and lights, that you cannot help but feel the joy of the approaching Christmas season. Germany is known for its magical Christmas markets and people come from all over Europe to shop there and buy their Christmas items. It can be the perfect weekend getaway if you live close enough and want to experience Christmas all around you. for hanging on a Christmas tree. ... of natural material, with just a hint of sparkle from sprinkled glitter, and more and more people are decorating their trees with natural ornaments now. It adds an authentic look to your tree that reminds you of a more traditional Christmas from long ago. Christmas decorations at the Christmas markets in the town of Erbach, Hessen, Odenwald, Germany, Europe. I photographed this photo with the digital SLR camera model Canon EOS-1Ds Mark III, aperture of f/5.0, exposure time of 1/400 sec. on ISO 100, as always I used a original Canon Lens, the focus lenght for this picture was 140mm.